This professional head shot by photographer Missy Timko was taken against a grey backdrop in her Pittsburgh photo studio. In this picture Amber is wearing glasses. Glasses often present a challenge for a portrait photographer. Thankfully, there are steps I can take in order to make sure that I obtain the top head shot possible. For starters, if you typically wear glasses, then you will want to wear them for your headshot photo. You want to present the look that is most common for you, so that when you meet in person, you will be easily recognized. Since there is often a glare associated with light reflecting off of the lenses, I will take steps during the photo shoot to limit the glare present in your glasses. Additionally, I can use Photoshop to reduce glare in post-production. 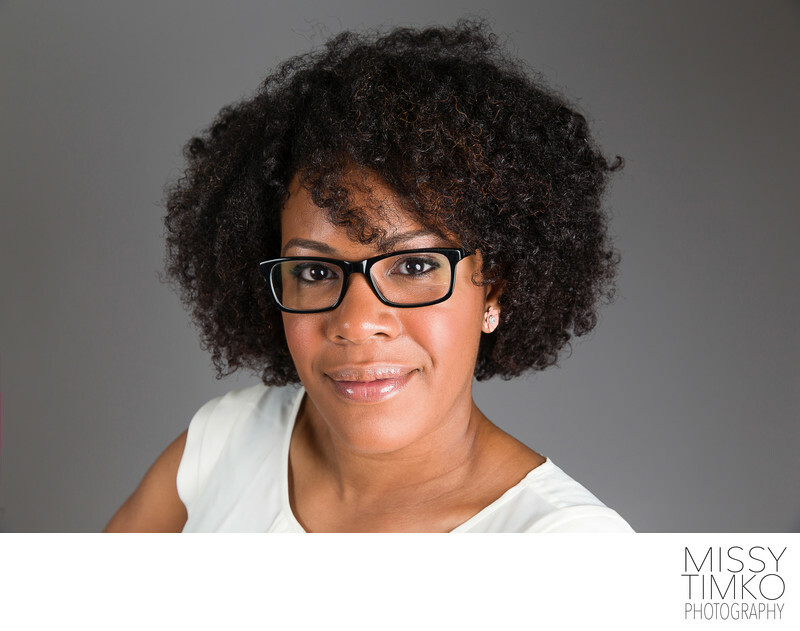 Regardless, if you are bespectacled, I will be able to provide you with head shot images that exceed your level of expectation.